While rounding the north side of Rum (Kilmory Point) Canna hovers into view, this is the outermost Isle of the small isle archipelago. We are fortune enough to have the glorious weather on our side which isn’t unusual for May. I try not to give much away on the history of Canna as I have organised two guides from Canna National Trust to meet the group on arrival. However, we do have a brief talk which has us laughing with confusion as I discuss St Columba and his connection with the Island, where he is believed to have landed in 563 whereas my guest mistook the name of Christopher Columbus who discovered the America’s in 1492, this making him the eldest man ever to have existed!!! This charming remote island which I have been visiting since 1985 as a fisherman offered a welcome safe heaven in some of the worst weather you can imagine in the south side of the Little Minch. The Island usually has a good array of sea birds to catch sight of including the popular puffin. Today they are possibly feeding further out at sea as non-were sighted, this doesn’t deter the trip because the guided tour has out guests strolling along Canna to soak up the natural beauty, flora & fauna and well sedimented history which is more suitable to the group. 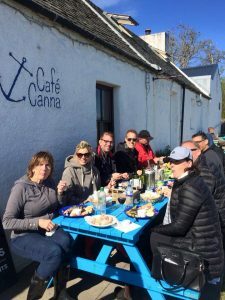 We finish the trip with a late lunch at the Café Canna consisting of the most delicious fresh local langoustines being the popular choice for our guests. Back on board the Cyfish, everyone is fore filled with their adventures of the day. We cruise back to Mallaig in a serene atmosphere.